Coughing attacks always happen at the most inconvenient times. Two examples would be in the middle of the night when I would rather be sleeping or during church when it's really quiet. Sleeping with the window shut helps me sleep better because my nose and throat aren't itching like crazy. I get hot though. I'm not sure which is worse. The Kleenex with lotion in them work. They don't cost that much more either. Sadie is getting a lot of practice at saying "Excuse you, Mommy" after I sneeze. I'm not sure if I like the way NyQuil makes me feel. I use to love it but I think I've changed my mind. There is no such thing as a "sick day" when you are a mom. Although Blake has let me sleep in a few days and that's been nice. Pretzels are a good thing to eat to scratch the back of your throat. However, if you also have a sore throat they can be painful. 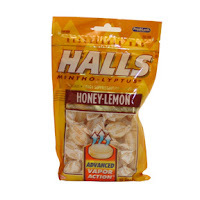 The cough drops with menthol work better. The fruity non-menthol ones are tasty but the lemon menthol ones are more effective. Water is necessary but does not taste good when you have a cold. Juice tastes much better. Having allergies and a cold at the same time can take your motivation away. I'm going to go ahead and blame them for my lack of posting anything for so long. Thera-flu is my best friend when I have a sore throat. It's the only thing that soothes my throat when it hurts to swallow. Also, the Sudafed non-drying medicine with the teal accent on the box is the only over-the-counter medicine that works for my sinus' and allergies. I've also been known to use the Sudafed green box specifically for allergies as well. Hope it helps. Wow! Thanks Lexi! I am going to try that stuff out!